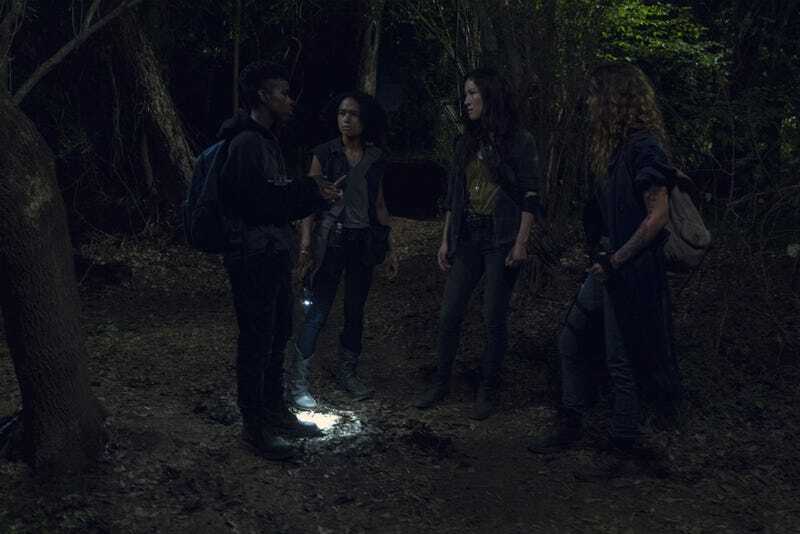 After almost nine seasons, it’s pretty rare for a brand new character to get their very own episode of The Walking Dead and yet that’s exactly what happened Sunday night. 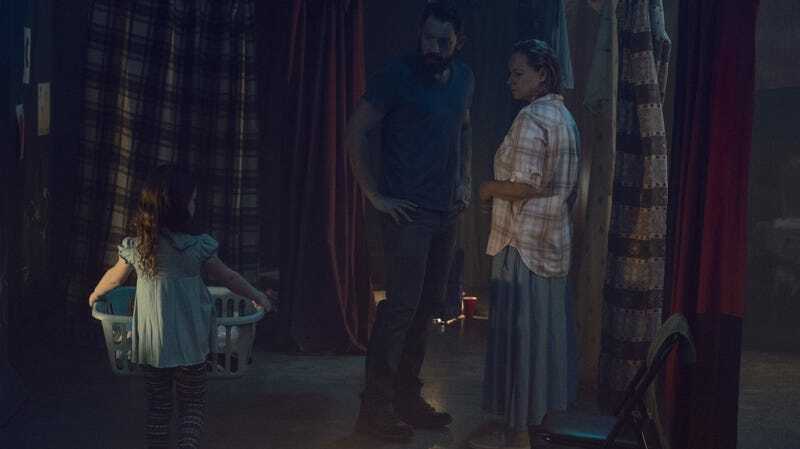 The episode, called “Omega,” introduced Samantha Morton as Alpha, the eventual leader of the Whisperers and mother to Lydia, the young woman Daryl and Michonne captured last week. And she is not to be messed with. The episode flashed between the present, where Lydia is still in her cell talking to Henry at the Hilltop, and the past, starting a mere three weeks after the beginning of the entire zombie apocalypse. A then very young Lydia, along with her mom, dad and a group of survivors are trying to wait out the chaos underground. In fairly surprising fashion, much of that storyline ended up being a ruse, both for the characters and the audience. Lydia is living together with her mom (Alpha) and dad. Dad has a beard. Dad shaves the beard off in an act of defiance. Soon after Alpha ends up suffocating a member of their group who was trying to escape and endangering everyone. In the next scene, the father has a fully grown beard again! But the dead person is still dead, and not a zombie...yet. Then he changes into a zombie, attacks Lydia, her dad intervenes and is killed. That’s a confusing timeline meaning either the beard grew quickly or the zombie zombified slowly. Maybe Lydia’s dad has just incredibly hair follicles or the show made a continuity error. Or maybe it was so early in the zombie apocalypse, changing into a zombie took longer. Just your basic, normal family, with a mom who kills her husband to save her daughter. Or maybe it wasn’t what really happened. As it revealed, what really happened was the man turned into a zombie, attacked Dad (with significantly less facial hair), Dad was saved, but Alpha then killed him herself. Alpha has been telling Lydia this lie about her father’s death for so long, Lydia began to believe it. Which says a lot about who Alpha is and what everyone else is dealing with. Hair might be a clue in these Lydia and Alpha flashbacks but becomes the focus briefly when Henry explains to Daryl that Carol (whose history shares some odd parallels with Alpha’s) kept her hair short for so long because she was scared her abusive husband would use it against her. Now though, she finally feels safe and has begun to grow it out. It was a nice note to show us how far Carol has come, how different she currently is from Alpha, and as a reminder that we’re now two episodes into the back half of this season and have seen very little of The Kingdom or Carol. That rather poignant idea is just another reason why the Whisperers feel like a truly worthy, different villain for The Walking Dead. They don’t just want to fight over resources like the Governor or Negan. No, they are fighting against the past and our concept of civilisation. And stuck between those two philosophies? Henry and Lydia who, over the course of the episode, begin to develop a zombie Romeo and Juliet romance. I’m not sure anyone should trust Lydia yet. She claims her mother won’t come for her when that is clearly not the case. But Henry doesn’t seem smart enough to see that. Otherwise, he wouldn’t let her out of the cage and tell her about all the advantages to his way of life. Although maybe Lydia can change. Just the mere sound of a baby crying may have been enough for Lydia to remember and once again embrace her humanity. 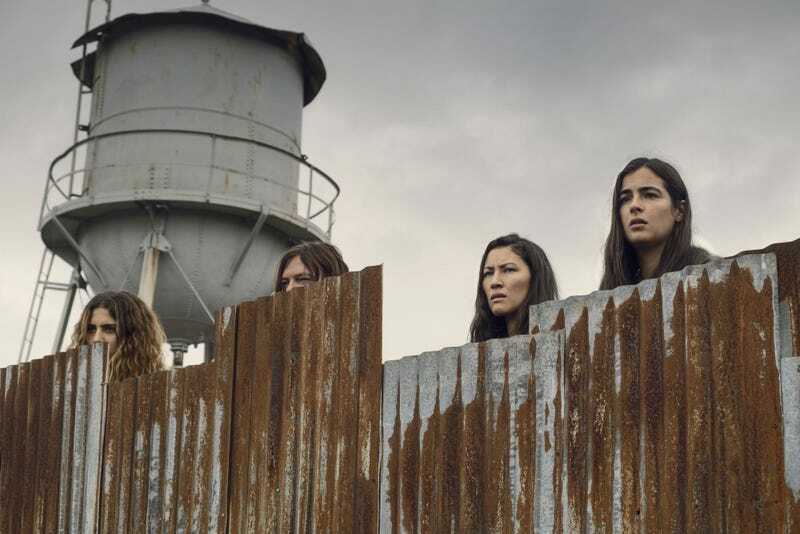 Overall, I have to say, “Omega” wasn’t exactly an exciting episode of The Walking Dead but it sure was interesting. We now have a really solid idea of what everyone else is up against. A villain and followers who don’t think about life in the same ways the heroes do. One who is willing to kill loved ones because of these beliefs. And guess what? She’s at the goddamn front gate. The ladies deserve better than that. I could be 100% wrong on the beard thing. I just know I made of note of it being a possible error while watching and then the show flipped it on me. The subplot with Kelly, Connie, Yumiko, and Magna was a huge letdown. We know they want to find Luke, but are they really dumb enough to go out in the dark to look for him, only to turn back like two seconds later? No, they aren’t. In fact, it kind of only happened so The Whisperers could follow them back to camp. Am I crazy or was there a shot of Lydia looking at some kind of hook on the wall that never came back into play? What was that about? As I mentioned last week, I skipped about two seasons of The Walking Dead and am only here on a temporary basis. So, I’m having a hard time figuring out/remembering where is where. There’s the Hilltop, Alexandria and The Kingdom, right? Wrong? It’s not easy to figure out as a relatively “new” viewer. Hopefully, Rob comes back soon and I feel less dumb.